WASHINGTON — An amicus curiae group filed a Supreme Court brief March 30 supporting the challengers in the ongoing Muslim travel ban litigation (Trump v. Hawaii). The amici include the Fred T. Korematsu Center for Law and Equality (Korematsu Center), the children of litigants who challenged orders that led to the mass incarceration of Japanese Americans during World War II, civil rights organizations, and national bar associations of color. Oral argument will take place April 25. The presidential proclamation at issue is the third iteration of the Trump Administration’s travel ban, implementation of a campaign promise that courts have repeatedly blocked in its prior and current forms. The challengers assert that the presidential proclamation, like the executive orders it replaced, violates the Establishment Clause of the First Amendment as well as the Immigration and Nationality Act. The federal government argues that the court should defer wholly to the executive branch because the presidential proclamation concerns immigration and national security, and that courts have historically deferred to the executive branch on these issues. In the brief filed last week, the amicus group argues that the Supreme Court can and should meaningfully review the presidential proclamation for violation of the Constitution, and that the government’s insistence on deference to the executive leans heavily on the “plenary power doctrine,” an outdated doctrine resting on a string of 19th-century cases infected with racist and xenophobic prejudices. The government used similar arguments during World War II in defense of Executive Order 9066, which authorized military orders that led to the mass Japanese American incarceration. In three wartime cases — Hirabayashi, Yasui, and Korematsu — the Supreme Court chose to defer to the president and the military in times of war, abdicating its role of asking probing questions and allowing the targeting of a group based on their national origin and race, rather than on individual determinations of guilt or innocence. The Ninth Circuit and Fourth Circuit Courts of Appeals demonstrated their understanding of this tragic history lesson when they rejected the government’s arguments in defense of both the earlier travel ban executive orders and this most recent proclamation. The brief reminds the court that the World War II convictions were vacated in the 1980s (the coram nobis cases), following the discovery of secret intelligence reports from the Navy, FBI, and the FCC that categorically denied that Japanese Americans had committed any wrong or posed any threat. Other Justice Department memoranda characterized the Army’s claims that Japanese Americans were spying as “intentional falsehoods.” These documents revealed that the government’s claim of “military urgency” was a smokescreen and that the government knew in 1942 that its own intelligence contradicted the rationale that the mass removal and incarceration program was necessitated by national security. This evidence was never presented to the Supreme Court, having been intentionally suppressed, and instead, the government defended its policies with racist generalizations about Japanese Americans. Years later, the acting solicitor general issued an extraordinary “confession of error” acknowledging the government’s role in the miscarriage of justice in those cases. 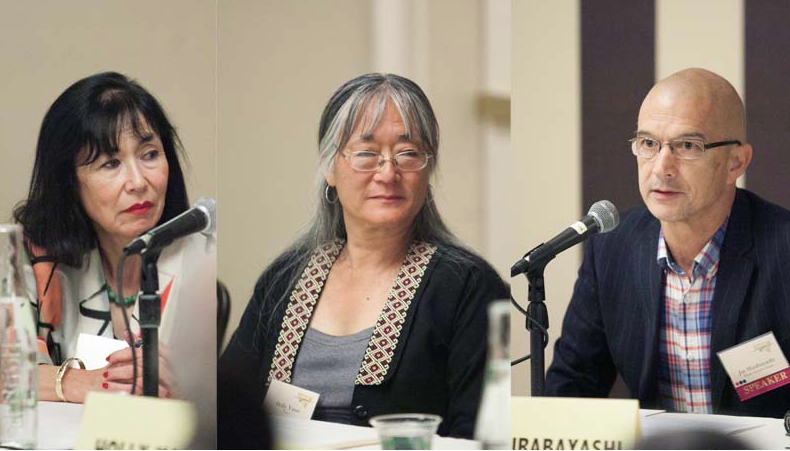 The individuals and organizations joining the amicus brief are: the Fred T. Korematsu Center for Law and Equality at Seattle University School of Law, Karen Korematsu, Jay Hirabayashi, Holly Yasui, Asian Americans Advancing Justice | AAJC, the Asian American Legal Defense and Education Fund (AALDEF), the Hispanic National Bar Association (HNBA), Japanese American Citizens League of Hawaii, Honolulu Chapter (JACL Honolulu), LatinoJustice PRLDEF, Inc., the National Bar Association, and the South Asian Bar Association of North America (SABA North America).